Okay, so 2010 brings us a new year, a new decade and for me...a new adventure, entering blogland. I am fascinated and inspired by all of the amazing blogs I read but thought I could never do that. 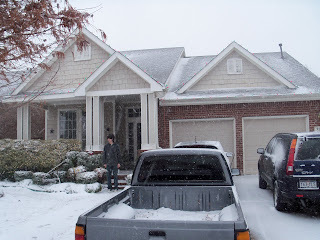 Then this past Christmas eve, we had a huge snowfall (2-3 inches is huge for us in this part of Texas). I was looking out of my front window watching the snow fall and noticed a little bench I have on my front porch. A simple, white, metal birdhouse sits on that bench and it was covered in snow. All of a sudden, it hit me and I thought, "that looks just like one of those pictures I see on the blogs, for White Wednesdays or whatever it's called." Maybe I could do a blog; maybe I should do a blog. I would at least have that little picture for it. So, you would think that my first post ever with my first picture ever would be of that simple white birdhouse on a snowy bench on my front porch, right? Of course not. I didn't take a picture of it! I was so caught up in the thoughts in my head while looking at that little birdhouse that I didn't even think to get a picture. Snow doesn't last long here in Texas and by the time I thought about taking a picture, the snow was gone. Live and learn. So, I'll start with this. This is my house. Hopefully this year, my house will see some improvements and changes...on the cheap. I am all about having my home look like something out of a magazine but I won't pay for it. I like to find things that cost little, use things in unexpected ways and do it all myself (or with my husband's self). Cute house, huh? Looks like a cottage which is what I like but it's actually 2 stories (4 bd, 3 bath, 3 living areas). Now, I know what you are thinking...you took a picture of the front of the house in the snow so why didn't you take the picture of the birdhouse? My husband took these pictures and I didn't know it. Apparently, the birdhouse vision didn't really hit him. Love your house- so much character! Can't wait to see what you do - good luck on this adventure!! congrats on your first blog! you will grow to be addicted to this. It is one of the best things I have given myself this past year and wish you wonderful days ahead! Welcome, welcome to blogland. You sound just like me! I am always thinking of things to blog about but then I forget to take a photo of something. I guess I just spend more time dreaming about what I'll blog about instead of actually doing. I hope you will be better than me at the actual blogging part. At least your hubby took a picture of your house in the snow. Well... a better way to soar into the blog-o-spher...I can't imagine. Your house looks gorgeous. What is in your head...even more so. Jump in , the water is perfect!! You will have such fun making your house your home.... will be back to watch it happen!